The Portland Aerial Tram opened to the public on January 27, 2007. Carrying passengers between the South Waterfront district and the Oregon Health & Science University (OHSU) campus on Marquam Hill, the tram covers a distance of 3300 feet while climbing 500. The tram is owned by the city of Portland and is part of the public transit system. 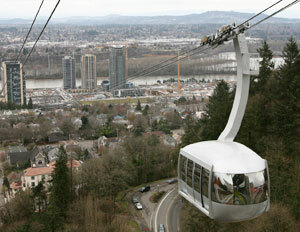 OHSU provided about 85% of the construction costs and operates the tram. Portland maintains the stations and tower. Much controversy surrounded the planning and construction of the tram, and it ended up costing several times the original estimates. Photo credit: Tram photo by Wikipedia user Cacophony. Used under the Creative Commons Attribution-Share Alike 2.5 Generic license.